Picking between electric strikes, magnetic locks, electronic bolts and locksets can be a complex decision. A number of factors determine what the best choice is, but picking the wrong type can land you in jail. The most appropriate method of securing a door depends on a large number of factors, including the type of opening itself, applicable life/safety codes, and door usage type. In this update, we address the regulations surrounding and describe the major types of locking devices. These terms describe the default behavior of the lock when power drops from the device. If a device is configured for 'fail safe' operation, this means that if power is lost, then the lock will fail in an unsecured position. This may mean the door can freely swing open or close, but in an emergency will allow unimpeded egress through the opening. By contrast, if a device is configured to 'fail secure', this means the device will default to keeping the door locked when power is lost. Usually this behavior is permitted in special conditions or if other aspects of the door hardware allows unimpeded egress through the opening in an emergency. 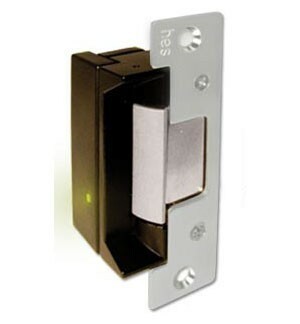 Electric Strikes are a common and favored method of securing electronic access controlled doors. Strikes are typically built with a mechanical latch that swings out of the way when a door opens. This is a very important characteristic of strikes; they are only as secure as the accompanying door hardware. The strike itself is designed to permit access even when the mechanical hardware is locked and the bolt is thrown. Strikes can be surface mounted on the frame (typically required when used with rim mounted hardware like panic bars) or mortised into door frames. 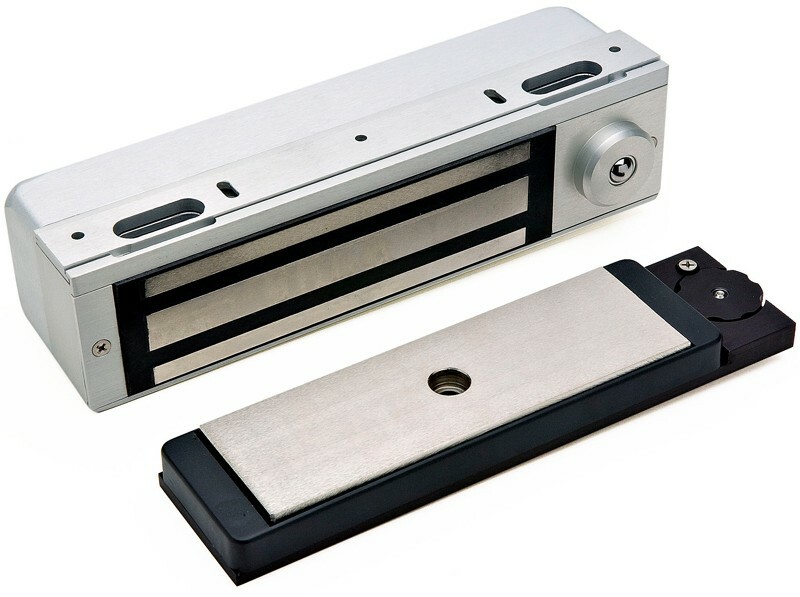 A variety of other access control components can be furnished in this type of hardware, including latch position sensors and card readers. This type of hardware can be bought in a variety of finishes, power options, mounting dimensions, and accessory options. The most commonly applied versions of the hardware cost about $125, and require periodic maintenance (cleaning and lubrication) to remain operational. Also commonly called 'maglocks', these devices are some of the strongest and most durable pieces of locking hardware available. They consist of two magnetically bonded components, typically measured by a shear force strength from hundreds to several thousands of pounds. A weakness of these type of devices is that they always must be mounted on the 'secured side' (inside) of the door. This is due to the vulnerability of cutting power connections to the device, or simply knocking the device off the frame from the unsecured side. This requirement may disagree with the swing of the door as it relates to the frame, but a variety of adapter plates are made to facilitate uncommon mountings. These devices also require constant and uninterrupted power to remain secure. 'Fail Safe' conditions are not always desired, so battery backup is a common feature of the power supplies for these locks. A common code restriction for these devices is that power is made to drop entirely when a fire alarm occurs. It is also very common for 'Request-to-Exit' (RTE) PIR sensors and Emergency Exit Buttons to be required for every opening that has a maglock installed. These devices are more costly, often selling for $400 or more per lock. However, other auxilary pieces of equipment like power supplies and RTE devices also add significant cost to this type of secured opening. It is not uncommon to spend $2000 on all pieces of hardware for this type of opening. Once installed, due to lack of moving or wearing parts, these devices are relatively maintenance free and suitable of heavy use. This type of lock features solenoid driven, hardened steel bolts that retract into the frame allowing the door to swing open. These bolts are most commonly mortised into the frame, but alternatively might be located on the leading edge of a door (the strike side), the hinge side of the door, or even the top edge of the door. However, these bolts are seldom located on the bottom (sweep side) of the door, due to the how comparatively dirty that edge is and how it may affect mechanical function of the bolt. This type of hardware can be bought for $200 USD, but requires periodic maintenance (cleaning and lubrication) and door adjustment to remain operational. This type of locking device is more of a hardware assembly than a specific device. These units often contain all components required to be a fully functional, self contained device for securing a door. Everything from a card reader to a power pack are included with these devices, and they are intended to replace existing unpowered hardware. These units often have some provision for wireless networking built into the device, and they are sold as a true 'bolt-on' access control solution with no additional cabling or wiring required. The features and pricing of these units are widely varied, and we intend to cover the more popular types in future updates. For the sake of contrasting to the other device types, however, the cost of these devices can be anywhere from $1,000 to $3,000 USD per device. Moderate traffic, single leaf interior openings: Electric Strikes are most commonly used. These devices are a good selection for security office doors, computer rooms, and storage closets. Weather proof and heavy duty versions of this hardware exists for applications like securing gates. High traffic, single or double leaf exterior openings: Magnetic Locks are a good fit. Many 'main entry' openings are secured with maglocks. These devices are very strong, have a low operation cost, and require minimal maintenance. 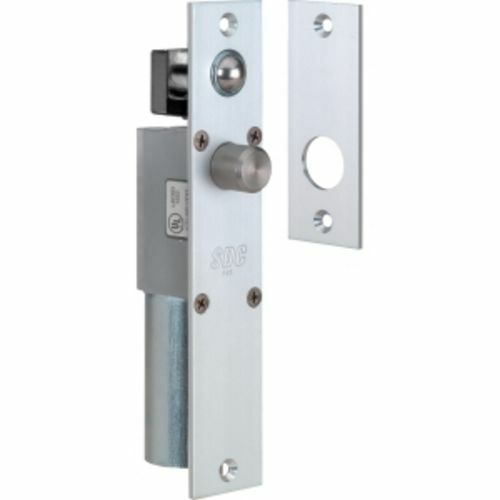 Higher cost and less discrete mounting options limit these locks for general application. 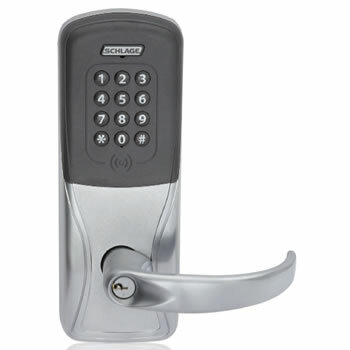 High security lock is desired but where maglocks cannot be placed: Electronic Bolts can be used. This type of locking hardware is very strong, but require more attention to keep maintained and aligned properly than strikes or maglocks. 'Package solution' desired for retrofitting a door: Electronic Locksets are best used. Units are available that for both single and double leaf openings. These 'all-in-one' solutions are more costly than building a solution from component parts. However, these solutions are the best answer when a quick integration is required.